A deliciously healthy broth-based chicken, quinoa, and butternut squash soup made simple in the slow cooker. In efforts to try some different veggies and a slightly different flavor I’ve changed up that original soup to bring you this creation. It’s SO similar to the sweet potato one that I wasn’t sure if I should even post it. But the flavors ended up being different enough that I thought some of you may like to try it! As similar as butternut squash and sweet potatoes are, to me they are pretty different. Just having the squash changes the flavor and texture quite a bit. Speaking of squash, it gets so tender in this soup that I mashed up a lot of it after it was done cooking. It makes the soup super hearty without any heavy cream base. You don’t have to mash any of the squash, but I really love what that did for the soup. Hearty soups are a must at my house. If a soup is too brothy or not “substantial” the husband is never a huge fan. He won’t complain and he’ll eat it, but he starts snacking pretty much the minute the dishes are done. For the other soup (the sweet potato one previously mentioned), I used a packet of chili seasoning. If you love those flavors, use it in this soup too! If you are looking for something different though try a fajita seasoning packet. It really changes the flavor from the other soup and we love it. I’ve tried both chili and fajita seasoning mixes in this soup and we love both. I can’t say which is better because they are just so different. You could also try using a taco seasoning packet, but I can’t vouch for the flavor since I haven’t tried it. It’s on my agenda to try though so an update will be posted…eventually! The seasoning packets are for ease and quickness. If you have some time, you can whip up your own seasonings and add it to the soup – that way you get exactly what you like. Remove the fat from the chicken. Rinse the quinoa in a fine mesh sieve to remove the bitter saponin coating. Peel, seed, and chop the butternut squash into small bite-sized pieces (or buy pre-chopped butternut squash for an even faster prep). Lightly grease your slow cooker with nonstick spray (I use a 6-quart crockpot). 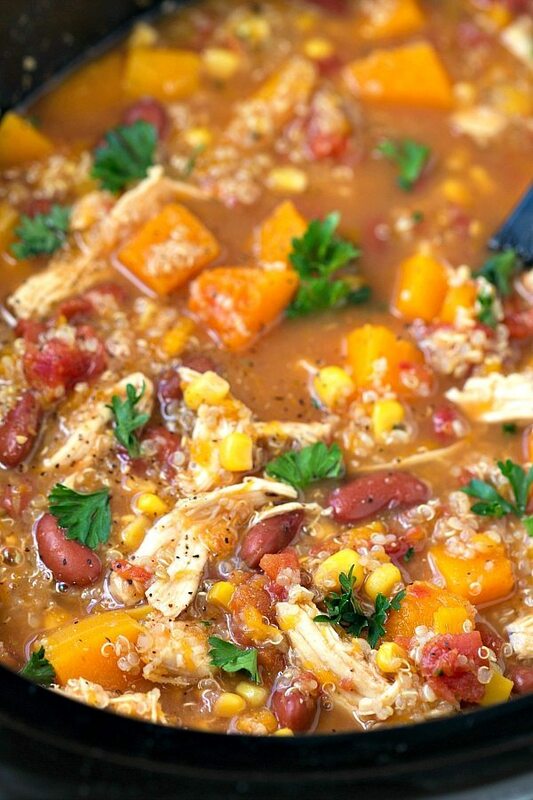 Add in the chicken, quinoa, chopped squash, kidney beans, corn, undrained tomatoes, garlic, and fajita seasoning packet. (OR try a chili seasoning packet if you enjoy those flavors better). Cover and cook on high for 3-4 hours or until the quinoa is cooked through and the squash is very tender. At this point you can remove some of the squash and mash it with a potato masher and then put it back in the soup. This is totally optional, but makes it a bit heartier. *I used fire roasted petite diced tomatoes for an extra kick of flavor. **Instead of chicken broth, I use chicken bouillon cubes dissolved in boiling water. I love all that sweet butternut squash in this soup, such a perfect dish for a fall day! This looks so hearty, but healthy! I also love the color in this dish…many times soup looks very dull, but this is bright and fresh! Also, I’ve never thought to use fajita seasoning..might have to try that in some of my fall soups/chilis. Thanks as always for sharing! I love making soup in my crockpot and am always looking for new ideas! This soup sounds wonderful! I have yet to buy butternut squash this season … so soon, so soon! Mmm…so many delicious flavors!! This soup is 100% going to be happening at my house this fall! 🙂 Pinned! I love how easy this soup is to throw together, Chelsea! This sounds like the perfect comfort food for the fall. 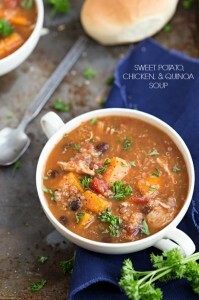 Love the hearty flavors in here, especially the squash! I’m so happy that it is finally soup season again (well, almost!) and this one looks awesome!! I love the quinoa and the squash in here – makes it such a hearty but healthy dinner!! I love how easy this is! 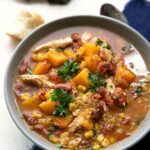 Fall is prime crockpot and soup weather and I think the family would love this one! Yay for soup season! 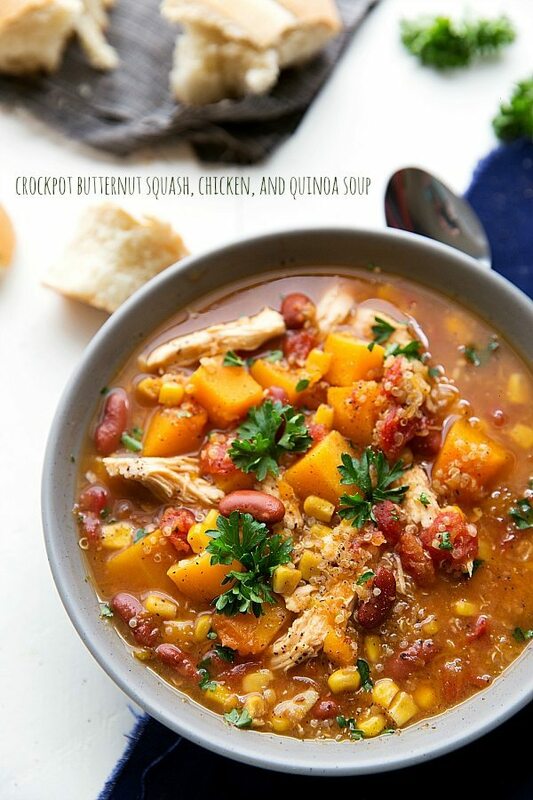 I have finally discovered the joy of making ALL the things in the crockpot and I love anything with squash, so this comforting cozy soup needs to go on the menu,Pinned! Did u make it and rate it 5 stars? This is officially my most favorite crock pot soup. Amazing! Awe that makes my day!! So great to hear 🙂 Thanks K! I love this soup. I made it tonight. I put a can of rotel in the place of diced tomatoes, it was delish. I will be making this again. Thanks for the recipe! So glad to hear you enjoyed this soup! 🙂 Thanks for the comment! Excited to make this tomorrow! Do I leave the chicken whole or cut it up before I put it in? If your chicken breasts are small you don’t need to cut them up, but I generally will cut up the breasts into 2-4 large pieces to help it cook quicker and in time with the other ingredients 🙂 Hope you love this!! Does it need to be on high for 3 hours or could it cook longer (6 hours) on low? I recommend just doing the high setting. At a low setting the quinoa ends up absorbing tons more liquid and becomes less “firm.” If you don’t mind having more of a stew and a slightly different textured quinoa, the low setting will be fine. I did it on low for about 7-8 hours. It definitely turned out more stew like. I put the quinoa in right away in the morning, but you could also throw it in towards the end if you wanted it firmer/less stew like. I also think that if we had eaten it about 6 hours in it would’ve been more soup like, based on what I saw when I shredded the chicken. The chicken turned out so tender this way though! The soup (or stew!) was delicious. Soup looks stunning, but I hate kidney beans. Any other suggestion? You can substitute a different kind of bean you like – perhaps black beans? I would def. use black beans. I think this recipe begs for them. To the writer who thought it was bland,, maybe addin a spicy salsa instead of the tomatoes might help in addition to adjusting spiced to taste. Just a thought. I’m planning to make this tomorrow. Would ground beef or sausage, pre-cooked work in this recipe as well? We’ve actually made this with black beans too and it was awesome!! Definitely add in a can if you like them 🙂 And yes, I think ground beef would be delicious in this! Not sure about ground sausage from a flavor perspective, but it may work! Nutrition facts about these recipes would be very helpful. Needed for health reasons in fact. Please. Thank you. Total sodium without even adding chicken, quinoa or butternut squash is over 7,000… how is it only 500 a serving? What nutrition facts counter are you using? Sodium can very a lot by brand or if use no salt added beans, corn ,tomatoes or broth. I’m trying it tonight with no salt added beans and broth . Just made this today and tastes great! What are your thoughts about storing some in the freezer? So great to hear!! Thank you Julia! I’ve actually never frozen this soup, but I haven’t had great success with freezing and then thawing cooked quinoa in a soup so I’m not sure how it would work out. Sorry to not be of more help. Hi Chelsea, just wanted to let you know I had some leftovers frozen for about a week and it still tasted good! Soup was delicious! However, mine came out a little mushy in terms of the squash. I think 8 hours on low was a little too long. Oh bummer! I’m sad you didn’t love it!! Did you change anything about the recipe? Everyone likes different levels of spice so I would recommend adding some different spices if you try this again. Perhaps instead of using a packet try your own mix of spices! 🙂 Or you could leave the recipe as is and just add a few additional teaspoons of different spices such as chili powder, cumin, paprika, cayenne pepper, garlic powder. (These are the general spices in a fajita seasoning packet, you would just be increasing the amount to your preference! This is literally the best soup I’ve had this year!! Maybe ever!! And I love how healthy it is!! So you don’t cook the chicken or squash before you put it in? I’ve never made a slow cooker soup/chili recipe that doesn’t use already cooked and shredded chicken. I’m looking forward to trying this out this weekend! Just wanted to ask, I assume this recipe is for a 4qt Crockpot? I’ve got a smaller 3qt and will have to adjust it. I made this today and enjoyed it for my Halloween dinner. Delicious! What a great way to celebrate Halloween 🙂 Thanks for the comment, I’m glad you enjoyed the soup! Oh my goodness, I made this soup this week, and it is SO YUMMY! Like, honestly my new favorite soup! 🙂 So easy, so delicious, and will definitely be going on the dinner rotation over at my house! 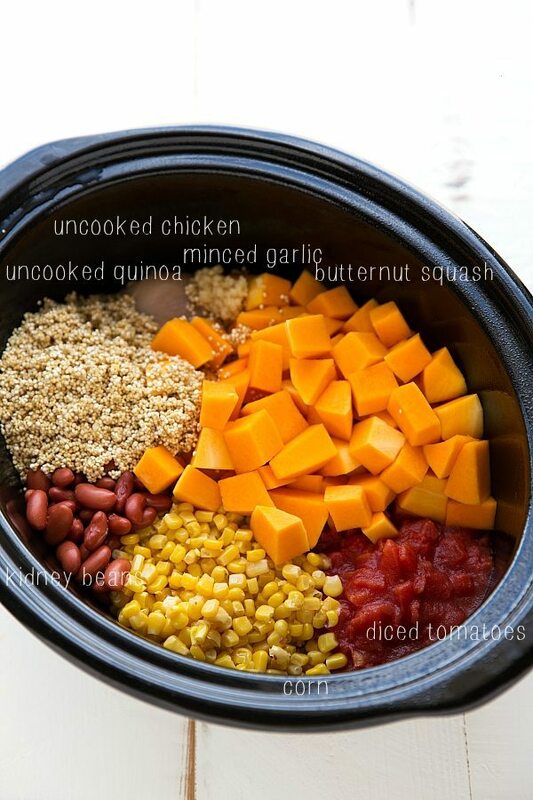 This looks so good & I love that it’s crock pot friendly! Definitely trying. I totally related to your comment about your husband – last time I made soup I ADDED meat to it but my husband said it needed more meat and sometimes he thought I was a “partial vegetarian” – after adding meat! haha. I do love how hearty the soups are with squash. I just wanted to let you know that I tried this tonight and it was excellent! I don’t like corn, so I omitted that, and I didn’t have any fajita mix, so I used a few different spices. I am not a big chili fan, so I dumbed down the “hotness” that’s really in fajita mix. I used lentils instead of rice, and I used tomato sauce instead of diced tomatoes. It was really good! We have too much, so I am going to share it with the family. Thanks for the recipe! LOVE hearing all the creative ways you changed up this soup — I need to try it with lentils 🙂 Sounds awesome! Thanks for the comment!! Gotta tell ya… As a hard-working single lady that spends 2-3 hours commuting for a 9+ hour work day, I love having “Crockpot Sundays” in order to keep the cooking to a minimum during the week, but I will easily get tired of eating the same thing after 4 meals…. BUT NOT THIS! SUPER YUM and SATISFYING!! Made it a few weeks ago and already planning to make it again for the short week before the holiday. Thanks for sharing!!! This is right up my alley! Can’t wait to make it today. I love your comment about your husband mine is the exact way, will eat it but start snacking! Just a quick question for the broth how many bouillon cubes did you use and how much water? Hi Anna! I’m sorry for the delayed response on your comment! Trying my hardest to get through all of them as quickly as possible 🙂 I used 5 cups water and then add 5 teaspoons of chicken bouillon powder (or 5 cubes that would equal a teaspoon if crushed down and measured — so just not the super huge cubes) I lately tend to use the chicken bouillon powder more than cubes but either will work! Instead of the seasoning mix do you have a recipe to make your own because I don’t like the additives. Awe thank you so much Lauren! 🙂 So glad you enjoyed it! This soup was fabulous!! I added medium salsa instead of canned tomatoes and used a blend of Tex Mex seasoning and chili powder. It had amazing flavour. Even my two and four year old boys ate it! I pureed three quarters of the squash which made it nice and creamy. I don’t think it needs any toppings. It’s great the way it is! I’ll definitely make it again. I might try sweet potatoes next time for fun. This is a good hearty winter soup. I wonder… Has anyone tried freezing it? Wondering if it would be ok? (although I’m ok with having it for leftovers for the next couple days too 😉 Thanks for the recipe! Yeah!! So great to hear 🙂 Thank you so much Krystel! 🙂 It’s the best when those little kiddos will eat it up too 🙂 I haven’t tried freezing it, so I’m not sure, but hopefully another reader can comment to that! 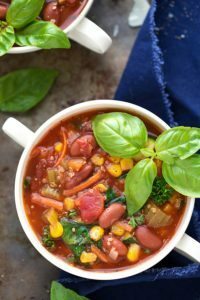 I know I’m a little late to the original post and most comments but I just found this soup and I believe I am going to make it this weekend. I just wanted to know if it will throw off the texture if I omit beans altogether? My husband hates beans of any kind so switching them out won’t work. Is there something else I could substitute in or should I forego beans? Thanks! You can absolutely forgo them, just knowing they do add a nice texture and taste to the soup so it may seem like it’s missing something, but I’m not sure what to suggest in its place..maybe increase the quinoa by a little? Wish I could be of more help!! I just made this and substituted curry for the fajita mix. Wow, fantastic! Thank you so much for posting this!! This may be my new favorite meal. I bought a big container of precut butternut squash at Costco and a quick look at Pinterest to find this recipe made a match made in heaven. Mmm. I am so happy to hear you enjoyed this recipe! And precut squash sounds perfect and makes for such a simple dinner! 🙂 And YUM on the curry — I am definitely going to have to try that the next time we make this! This soup sounds delicious. Just curious if I didn’t want the squash mushy could I add it in later so it won’t cook so long? Maybe the last hour? If you put it in the last hour I believe it will still be pretty hard. 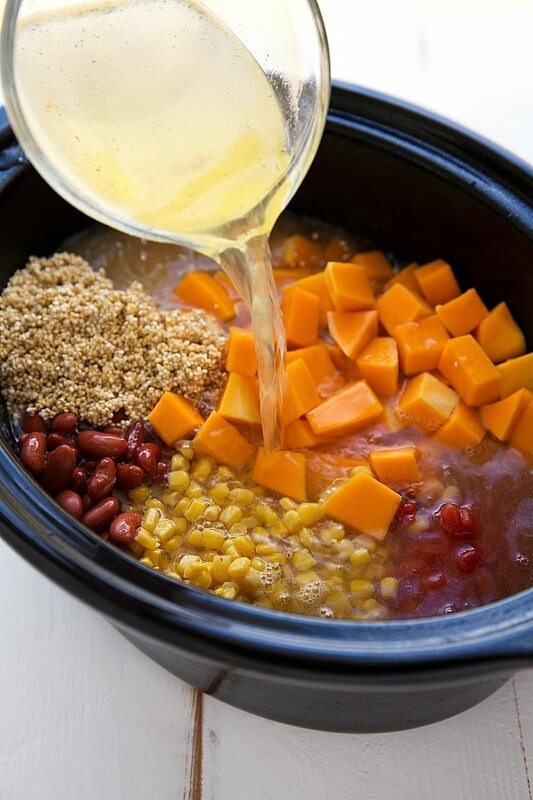 It takes the squash quite a bit of time in the slow cooker to get tender enough to eat. Thighs will work great in this! I LOVE this soup. I made it a couple of weeks ago and I’m dying to try it again already! I was thinking about adding in some kale towards the end to switch it up and get a little more leafy greens in my diet. Any thoughts on this addition, Chelsea? SO glad to hear that! 🙂 Thank you so much for the comment! I think kale would be wonderful in it! I’d add it just the last 15-20 minutes until wilted 🙂 Enjoy! I’ve made this recipe twice now and I just love it!! I was just wondering if the nutritional facts are per serving or for the entire batch? Really hearty soup. Im obsessed!! Excellent recipe! Just curious, in order to calculate how many weight watchers points it would be, is the nutritional facts pertaining to the whole batch or is that just one serving? The nutrition facts are per serving 🙂 Glad you enjoyed this recipe! How would i alter this for a 4 qt cooker? I would probably halve it! This sounds delicious! Do you think it would be ok to use chicken and squash that’s frozen. Or do you recommend dethawing first? I would recommend thawing first 🙂 Enjoy! Hi Jaime! 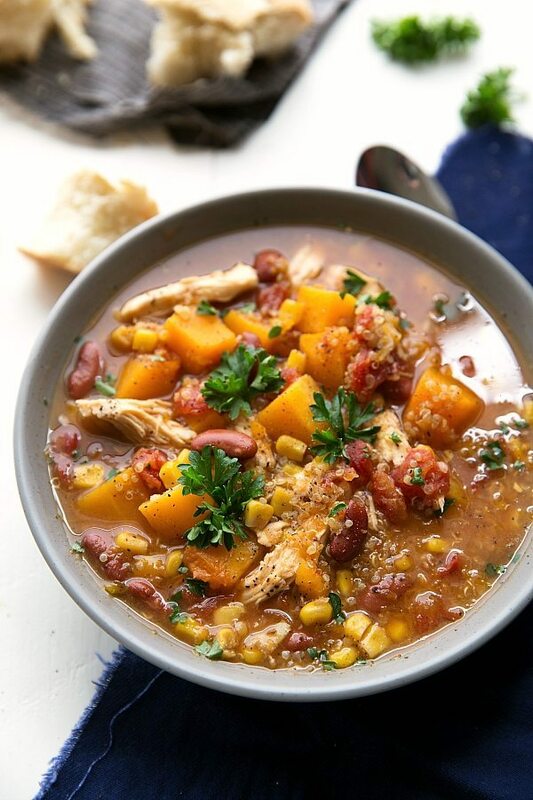 I would try the mix of seasonings in this soup: https://www.chelseasmessyapron.com/crockpot-chicken-veggie-quinoa-soup-video/ If you like a little kick but not feeling chili/fajita you may like this cajun twist! This is the best soup I’ve had in a while. I used black beans instead of kidney and loved it! The butternut squash cooked so wonderfully that the smaller pieces mashed themselves up as I stirred in the shredded chicken. Will make again, especially for my mother. Thanks so much for a great recipe!!! Just curious about your thoughts on using pre-cooked chicken or rotisserie chicken, or even canned shredded chicken? Would it change the flavor? I don’t like quinoa, do you think I could use Rice? I haven’t had success with rice cooking evenly in the crockpot, but if you cooked it separately and stirred it in I think it would be great! Love it!! Made this today as I wanted to eat something lighter and healthier after a couple days of the flu, and it was a perfect meal. My fiancé, who rarely eats soup, asked for seconds (for that alone, Thank You)! I did substitute the spices for a pinch of chili powder, cumin, salt and pepper. Also, I did mash some squash cubes at the end, and it was that much more scrumptious! Do you think this could be cooked in the Instant Pot? I received one for Christmas and have been wanting to try it out, and this seems like the ideal recipe. Just not sure how the timing would be in the IP compared to the crockpot. Thoughts? I thought the soup was delicious but I felt like the quinoa wasn’t substantial enough…maybe ditalini pasta or hearty barley would suit me better. Also I added fresh kale in to give it a green veggie and freshness. I made this tonight and it was delicious! I roasted a chicken yesterday and just used pulled pieces of that in the soup at the very end. My quinoa soaked up most of the liquid on the high setting for 4hrs, making it more of a stew, so I just added hot chicken broth to the bowls to turn it back into a soup. Loved it! Followed the recipe exactly!!! Thank you for sharing this recipe – I made it yesterday and it’s so delicious!! So good that my husband and I stood over the slow cooker eating straight from it with spoons! Outstanding flavor. I did not have corn and used pinto beans as well as leftover grilled chicken breasts cubed that I added 1/2 way through. Toco chips as a garnish was nice. Ooh I need to try it with salsa! So glad you enjoyed! 🙂 Thanks! Making this in the instant pot right now. Set it on high for 15 minutes. I’ll report back! I rarely cook but i’ve started to try and cook more, I tried this recipe and it was SO easy and tasted amazing! I’m wondering – has anyone tried adding more veggies into it, like carrots? I’m thinking of experimenting like that a little. Thanks! Made this in the instant pot and came out great! Manual setting for 25 min. Left the quinoa out and added it at the end and reset for 3 min. Perfect!